Amy (above) is a Super Senior. A Super Senior is any dog that lives well beyond their life expectancy. There's not a clear cut definition of how many years either absolute or relative to the dog's expected lifespan that this is, but at 21, Amy qualifies. Her story is amazing. She was adopted 18 years ago and has been in the same home all along. 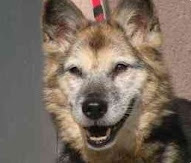 Her owner recently became unable to care for her and so back she went to Penny Adams of San Diego. 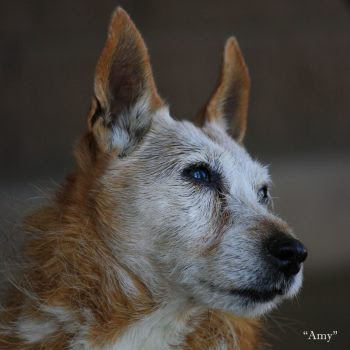 Amy's available for adoption over at our Senior Pooch Adoptions site. I've been spending some time over at Blue's Facebook page. If you remember, Blue is an older dog in Elephant Butte, NM whose town has rallied around him to allow him to remain leashless as an exception to the town's leash laws. Most recently it turns out that some yahoos have been harassing Blue when his supporters aren't around. Although courts have ruled that he can be free inside the confines of an invisible fence and he's not bothering anyone, it appears that there are those that have made time to harass him to the point that the shop owner is taking him home to protect him and has installed cameras. I hope those perpetrators of such heinous activity can look in the mirror and convince their significant others that they do the right thing, because I ain't buying it. Good luck to Blue and crew. 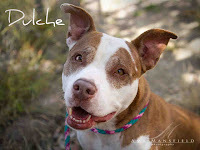 Another dog in the news this week is Lennox, whose story of Breed Specific Legislation has crossed the world, and who I provided the SeniorPooch position on during a post this week. This weekend I attended my first adoption event as a member of The Dog Squad. The Dog Squad were the group that saved Boo Boo from a life behind bars some five years back. There was a lot of interest in the dogs. Although none went to their forever homes that day I'm hopeful that those families that showed interest, followed up with the shelter. Dulche, the dog in the picture next to my update about The Dog Squad, was adopted! I met her at the event and she's a very sweet mellow girl. I'm sure she'll be perfect in her new home.